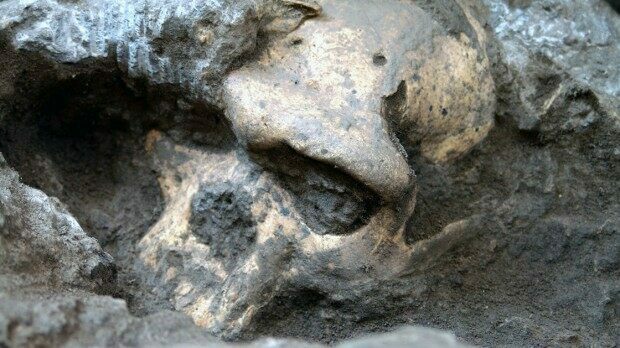 In Dmansi, Georgia, a 1.8 million year old skull is found in the same area of collapsed carnivore dens as other H. erectus from the early Pleistocene. This particular skull is strikingly complete, and belonged to an ancient human who was eaten by one of several large carnivores that also shared the local watering hole. What makes this discovery so astounding is that the unusual dimensions of the skull, along with those of other local skulls, reveal that there was a wide breadth of normal variation in Homo erectus. This suggests that several described human ancestors from Africa may not be separate species, but may be variants of H. erectus. This is a ground breaking idea regarding our ancestors that radiated from Africa, and who may have been the first of our lineage to use fire to cook food. Critics suggest that while this new discovery is an amazing new reference for species diversity, caution must be used before entire branches of the human family tree are summarily chopped off. 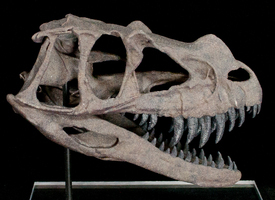 More skulls from Asia are needed to corroborate observations. 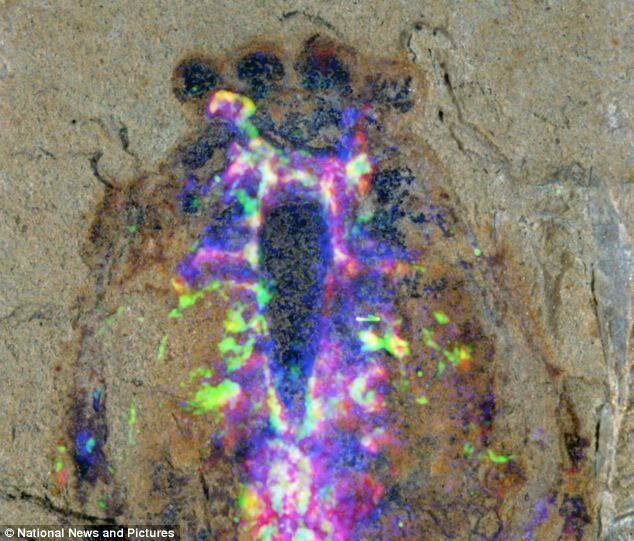 A new fossil relative of spiders and scorpions was discovered in China- and this weird creature of the Cambrian marine is stranger than fiction. A member of the Alalcomenaeus genus, this megacheiran (“great-appendage”) arthropod lived 520 mya, among the ancestors of crustaceans. This new species is believed to have been 1 inch long, possess two pairs of eyes, had an elongated and segmented body with 12 pairs of appendages, and had a pair of scissor-like head claws. The organization of its neural anatomy reveals a similarity to the chelicerata (horseshoe crabs and scorpions). In fact, the brain is like that of modern spiders. Scientists are currently searching for a shared ancestor between this new creature and the ancient crustaceans. Feline fossils from 3 individuals related to the snow leopard, support DNA data which show that Pantherine felids, or big cats, had geographic origins in Asia. While the new species, Pantherine blytheae, is not the first species of big cat to evolve, it is possibly the oldest ever discovered. These fossils push the origins of big cats back by 6 million years- placing their emergence to 10 mya. Scientists going through a Middle Jurassic insect collection in Beijing found two froghoppers that were trapped in ash while they were copulating. 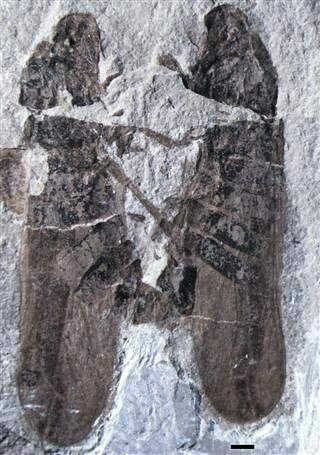 The connected insects are one of only 33 examples of copulating insects in the entire fossil record. The other wonder of this frozen moment is that this 165 million year old behavior matches that of modern froghoppers. While it is possible that the position of the insects could be a result of sediments pressing together, the similarities with the modern froghoppers suggest it is truly a rare snapshot of ancient insect passion. What Came First? Scales or Teeth? Paleobiologists from the University of Bristol challenge the idea that teeth appeared first and evolved into scales as a predatory adaptation. Dr. Donoghue and his team reported in Nature how they examined conodonts using high resolution X-rays. 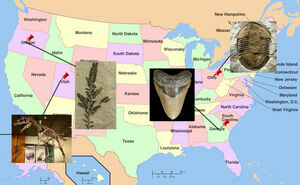 They concluded that in fact, conodonts did not contain dentin and are not directly related to teeth! The team believes that scales appeared first for protection, and later evolved “outside in” to become teeth. 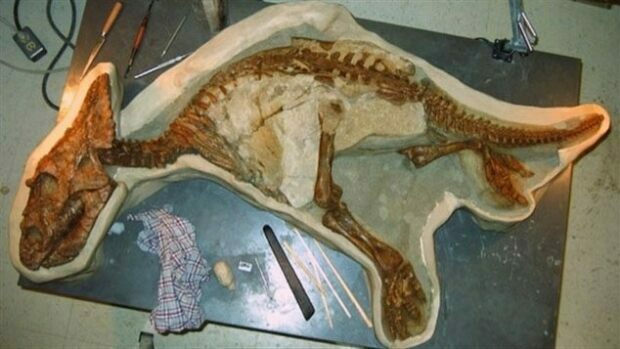 An exceptionally preserved baby ceratopsid- the smallest and most intact ever found, was unearthed in Dinosaur Provincial Park in Alberta. This baby Chasmosaurus belli, from 70 mya, likely drowned and was buried so quickly that even the rosette pattern of its skin impressed the rock that entombed it. The initial discovery was made in 2010, and was only recently made public. This little dino baby confirms that the frills of chasmosaurs change shape over 20 years while they mature. A Wyoming rancher discovered the remains of a small group of triceratops that were gruesomely chomped at a possible feeding site for T-rex. The skeletons of the trio have a miraculous level of completeness, and some bones are expected to yield insight into T-rex feeding behavior. This is the first indication that Triceratops moved in groups, though many details of the trio have yet to be revealed. Ancient microbial mat communities left evidence of their ecosystem from about 3.48 billion years ago. These communities are recorded in microbially induced sedimentary structures, or MISS, within the Dresser Formation. These rocks in northwestern Australia contain the oldest sedimentary layers which have escaped destruction from plate tectonics. As a result, the Dresser MISS displaces those fossils of Africa that previously held the title for the Oldest Life on Earth. T-rex was a predator! I know- we all just sighed a collective, “No kidding.” But really, where was the EVIDENCE that this 40 foot long monster was chasing down prey and not simply tearing apart an old carcass? The proof was found in a duckbill dinosaur’s tail, and then analyzed at the University of Kansas. 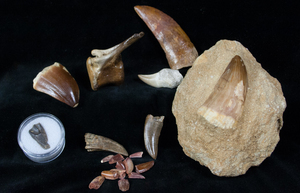 A T-rex had savagely broke its tooth off in a lucky duckbill that somehow escaped, healed, and lived to die another day in a manner that preserved that moment for us to wonder at in 2013. In Siberia, 10,000 year-old liquid Mammoth blood was discovered oozing from a spectacularly preserved carcass. The female mammoth was buried in ice on the Lyakhovsky Islands off the coast of northeast Russia. The Northeast Federal University in Yakutsk will be working together with South Korean scientists to clone a woolly mammoth from the only such blood that has ever been discovered. Note: The there is a lot of controversy surrounding the mammoth blood story as while is was widely reported it was never independantly verified. 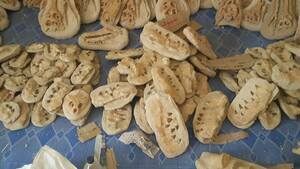 Many experts highly doubt the validity of the claims, but that also makes it an interesting story in 2013.